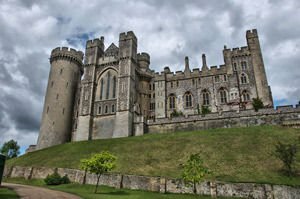 In southern England, nearly four miles north of Littlehampton, West Sussex area is one of the medieval treasures of the British Empire - Arundel Castle. This impressive castle towers over the little town, which is located about 80 km southwest of the capital London. Arundel was built in the late 11th century by Roger de Montgomery, who at that time was Earl of the town. Nearly 1000 years of history lies beyond the walls of the castle Arundel, which has wonderful views of the River Arun. Indeed Arundel Castle was built in 1068 during the reign of William the Conqueror, as a protective fortification of the river Arun. After the death of the local graph, the estate passed into the hands of Henry I, who after his death left it to his second wife. In the following centuries it belonged to Henry II, who bequeathed it in turn to Richard I or known as Richard the Lionheart. Today the Arundel castle is privately owned by the Duke of Norfolk and his family, but most of the castle and 40 acres of the yard and garden are open and accessible for tourist visits. No visitors are allowed only in the wards, which are populated by the owners of the palace. For the convenience of thousands of visitors a year here, the castle has a restaurant and shop for souvenirs and gifts. The interior of Arundel is captured with antique paintings, furniture from different periods, beautiful exquisite windows. Among them are scattered throughout various sculptures, coats of arms and armor, behind which lie profusely ornamented carvings. During the civil war between 1642-1645, the Arundel Castle suffered severe damage and casualties in two attacks. Charles Howard, who is the 11th Duke of Norfolk, made significant improvements and major repairs of the castle Arundel, having fully completed the renovation in the late 18th century. In 1846 Queen Victoria decided to visit the palace and then becomes its owner, the 13th Duke of Norfolk, later constructed more repairs. After visiting the high personage however the rooms, known as the chambers of Victoria were restored to the original form. An interesting fact is that Arundel was used in many movies and TV shows such as "Young Victoria" (2008) and "Madness of King George" (1994).